My dad used to roast the pumpkin seeds after he carved the Halloween pumpkin with us kids, and now it’s part of my family’s Halloween tradition. My eight year old likes the roasted seeds as much as I did and still do. 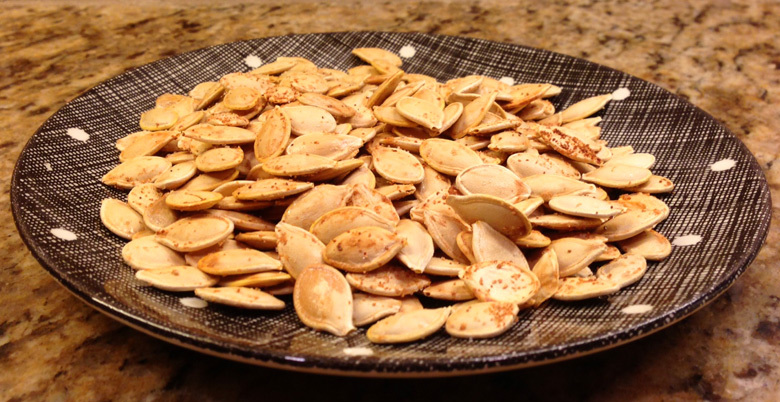 I look forward to this every Halloween, because roasting pumpkin seeds is something you’re really only going to do once a year, and those toasty seeds warm right out of the oven are really tasty. 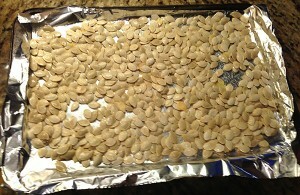 After removing the insides of the pumpkin, separate the seeds from the pumpkin insides as much as you can. 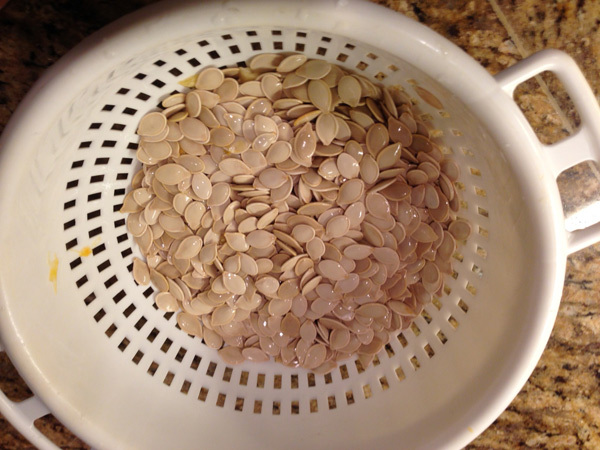 Put the seeds in a strainer and rinse well. 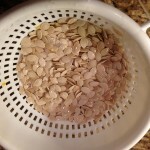 While rinsing, use your hand to sift through the seeds and remove any remaining pulp from the seeds. Preheat oven to 350 degrees. 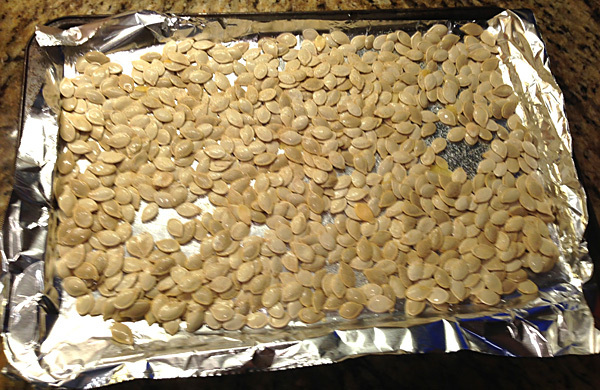 Put a sheet of foil on a cookie sheet and spread a little vegetable oil on the foil to keep the seeds from sticking. Spread out the seeds on the cookie sheet in a single layer- if you have a lot of seeds, do two batches or two cookie sheets, not two layers. Sprinkle salt and garlic powder lightly over the seeds and put in oven. The seeds will take about 1/2 hour to get brown and toasty. Every 5 minutes or so, take the tray of seeds out and move them around with a spatula so the seeds get a chance to first dry out and then brown evenly on both sides. The seeds are done when they’re toasted light brown– careful not to burn them! Enjoy.